For Air Max Day 2018, we used Instagram Stories in a new way to help Nike launch a new silhouette and innovative twists on beloved cultural icons. For Air Max Day 2018, Nike wanted to celebrate the history of the iconic Air shoes on Instagram. 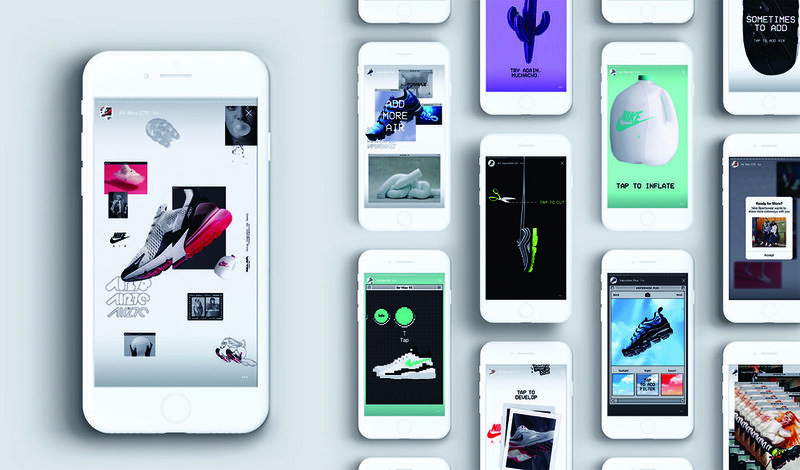 The brand had created visual “worlds” for each Air Max, and wanted a way to draw consumers into these worlds while standing out in sneaker fans’ saturated Instagram feeds. Instagram stories are linear. You tap, you like, you scan and you move on. We wanted to break this pattern, so we embedded a sense of gameplay and interactivity into our stories that made them stand out and encourage interaction. Each story was a little adventure into a Nike Air world, emulating the games and media of each shoe’s history and cultural impact, with easter eggs and choices at every step. Our immersive Instagram Stories sought to create brand impact by mirroring the experimental and bold creativity of Nike’s Air Max sneakers. With dozens of tap-worthy interactions, the stories consistently outperformed Nike benchmarks for Retention Rate, Exit Rate, and included a swipe-up to feature leading to Nike.com, where 4 of the 5 sneakers sold out within hours of their release.